The following are a few samples of what I love about Kathmandu and Nepal. Stray dogs are everywhere. When I was traveling in Guatemala last year, the dogs were skinny, mange-y and definitely afraid of people. Being an animal person, I wanted to pet them and love them, but it was not a good idea. The people of Guatemala were warm to both me and RF as we traveled, but the same kindness was not extended to the strays. As a result the dogs looked downtrodden and depressed most of the time. You would see a relatively happy one occasionally, but on average, their lives seemed very stressful trying to survive. Here in Kathmandu, the strays are happy. Often they look well-fed, perhaps because of the large amounts of food in the easily accessible garbage piles. More importantly, they do not look depressed. Some will even run up to you. I had one dog stick his nose in my hand as I walked by the temple he was sitting in. They have such a trust in the human beings around them. Within the first week of being here, I noticed men holding hands with other men. Grown, conservative looking men. Of course coming from NYC, my initial thought was that they must be couples. But I kept seeing more. And more. And more. Now, I know Nepal is trying to be more gay- and trans-friendly, but I also know that the law often seems to move ahead of society in this respect. Finally, I had to ask and was told that it is a cultural thing, not a gay thing. I am absolutely (and hoping) to learn that men in my country can and do physically touch one another in other situations and circumstances (Bromance hugs, maybe? ), so please comment if you can come up with other times. The idea of the lack of touch makes me quite sad. I have experienced it myself, so it is not some maudlin assumption about men missing out on something wonderful in life because they have to protect some silly idea of what it means to be a man. Touch has power. 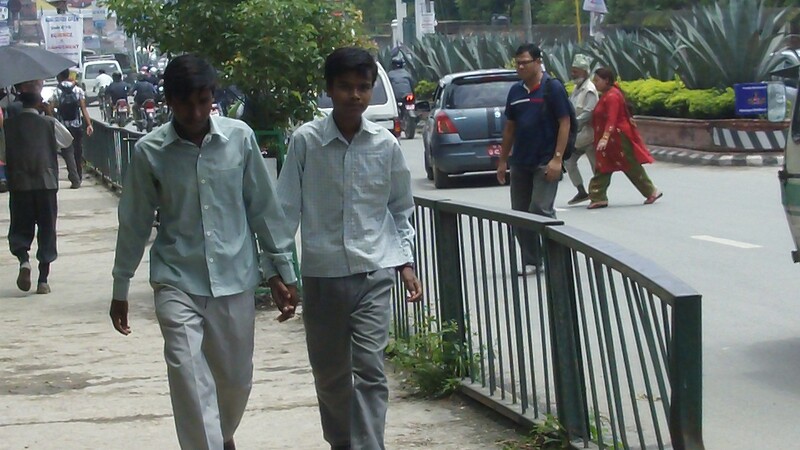 Let us learn from Nepal and expand our understanding of masculinity. As you walk through Kathmandu, you see tons of construction. When you go to a restaurant, you have to wait longer than you do in the USA for your food. Men and women sit at sewing machines making or fitting clothes for their customers. The work in Nepal is done primarily with human hands. To me, there is something magical about working with your hands. Perhaps because I often do not get to (evidence of this can be seen in how raw my hands got while canyoning). I have made blankets and clothes before, but most of my time is spent like I am spending it right now: in front of a computer, trying to avoid Facebook and Google+ in order complete what I deem as work. I buy my premade clothes and food in highly anonymous ways (even when I can make it to the green market), and I know the buildings I live and work in are made by machines run by people. My life is mechanized, ordered and templated. The specificity that seems to come from something made by hand (this building, this road, your sari) gives me joy. Working hands have a beauty to them, and work done by hands has a personality. I know I am romanticizing the handmade. I know that the work that I witness can be backbreaking. I can guess that it may be underpaid and underappreciated. I am sitting and thinking about why it is that I find (other people’s) physical labor so comforting. Perhaps it is related to the anonymity of the people that make and grow my necessities. Perhaps because I feel very accomplished when I have completed a physically taxing challenge or even just had time to cook my own meal. Perhaps I am just looking for ways in which to slow down my urban life. I hope that the people actually doing this work find it far more satisfying than I do, and that this connection of the work to the people behind it lasts past my journey through Kathmandu. Crossposted at Rangi Changi Kathmandu. I think the male physical contact thing varies a lot depending on the social group. Coming of age among theatre-folks, we’re all touching each other way more than the USian non-related heterosexual average, I think. I saw this again this weekend when 2 of my husband’s former summer theatre roommates (they’re all hetero married men) came to see his show – the first time they’ve been together in several years. After the bro-hugs and greetings and brief catching up, we all even entered into a group hug/huddle there was so much joy at being reunited. But I think your alliterative list of 3 is pretty complete for most people.